Ewing’s attorneys told reporters they were worried that their client had met with “foul play”. Both the police and the district attorney were convinced that Ewing’s convenient disappearance was a hoax. With $179,000 (equivalent to $1.5M today) of his missing wife’s assets unaccounted for, and likely in his possession, Ewing could buy a ticket to anywhere in the world. 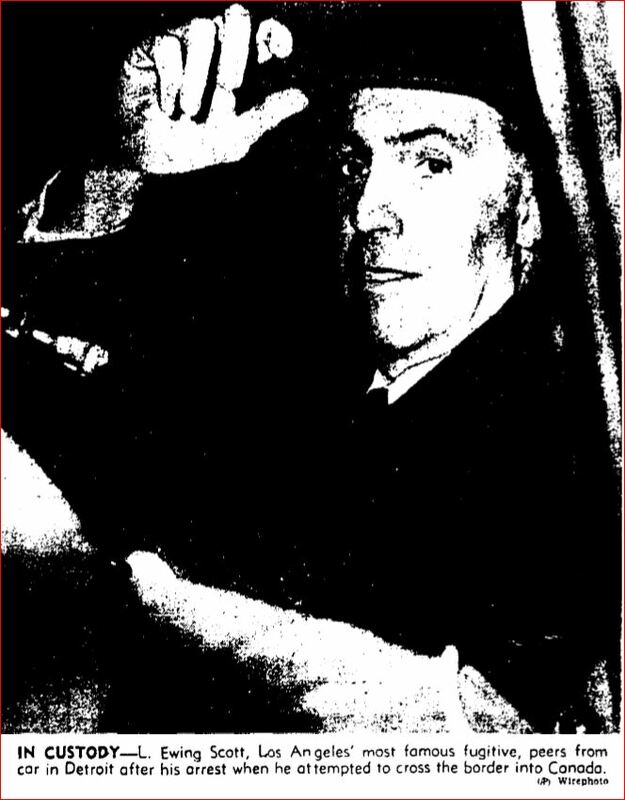 In his case it would likely be a place with no extradition treaty with the U.S.
Ewing’s recent companion, Marianne Beaman, might have been worried about Ewing after the sedan he’d been driving had been discovered in Santa Monica with bullet holes through the windshield. But her worry paled in comparison to that of Louis and Irving Glasser. The Glassers were the bail bondsmen who had guaranteed Ewing’s bail. If Ewing was a no-show, they’d be out the money. So, was Ewing sitting on a distant beach sipping a cocktail with a colorful little umbrella in it; or was he dead and buried in an unmarked shallow grave along Angelus Crest Highway? Nobody knew for sure. As in in many missing persons cases there were reported sightings of Ewing everywhere from Long Beach to Mexico. None of the sightings were verified. 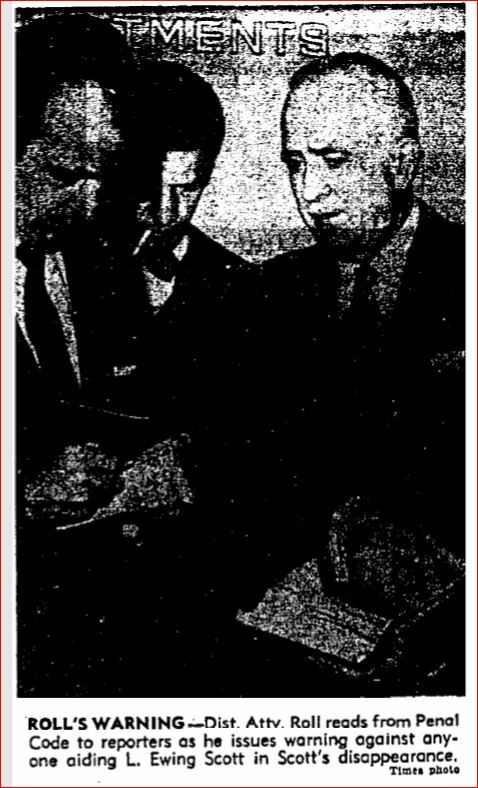 On May 15, 1956, after Ewing failed to show up for his court appearance, District Attorney Roll requested bail in the amount of $100,000, but Superior Court Judge Herbert V. Walker had a better idea. He ordered Ewing’s original $25,000 bail forfeited and issued a bench warrant for his arrest. District Attorney Roll read California Penal Code Section 32 aloud in the courtroom. He intended to drive home his point that anyone who “harbors, conceals or aids a principal … with the intent that said principal may avoid or escape from arrest, trial, conviction or punishment…” would be in an enormous amount of trouble with the law. If Ewing was missing under his own steam, a likely accessory would be Marianne Beaman, and the police and the district attorney intended to hold her feet to the fire. They had a list of questions that she would be required to answer if she wanted to remain a free woman. One of the questions had to do with a few gifts given to her by Ewing. Items of clothing that had belonged to Evelyn. A credible sighting of Ewing came from Bishop, California where he had allegedly spent the nights of May 2, 3, 4 and 5. Chief of Detectives Gordon Bowers of the Sheriff’s Department said he had alerted law enforcement entities from Los Angeles north to the Canadian border. Ewing remained at large through the rest of 1956. 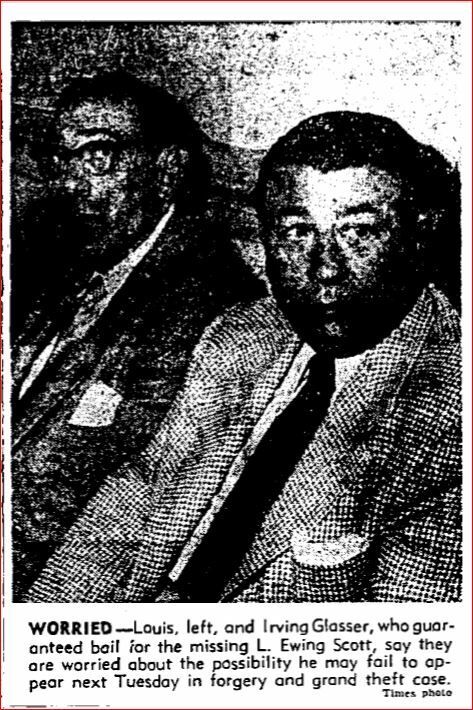 On April 15, 1957, eleven months after Ewing had vanished, a man who gave his name as Lewis E. Stewart was arrested in Windsor, Ontario, Canada just across the Detroit River from Detroit. Mr. Stewart strongly resembled Ewing Scott. And what a coincidence — his initials were the same. Ewing unsuccessfully fought extradition to California, and by mid-May he was returned to Los Angeles. Ewing’s attorney filed a plea to dismiss the murder charge against him, but the judge wasn’t having it. Ewing’s trial for the murder of his wife was set for mid-September. As Ewing awaited trial he spent a lot of his time attempting to sell his story to the movies. He wanted $200,000 for the tale and he claimed he planned to spend a significant portion of the sum to “follow up on a number of hot leads on the whereabouts of Mrs. Scott.” According to Ewing Evelyn was missing, not dead. 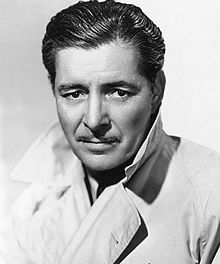 As far as any possible film, the charming, sophisticated and good looking English actor, Ronald Colman, seemed to Ewing to be the obvious choice to portray him on the big screen. Who would play Evelyn? Ewing wasn’t so sure. “As far as Mrs. Scott goes, I don’t know who would be exactly right. perhaps an older Peggy Lee, or Mary Astor. I’d have to see the woman first.” After further thought, Ewing said about the as yet unnamed actress, “I do know that she’ll have to be smart, dignified and rather good looking–and definitely not the wisecracking type.” Okay. I guess Joan Blondell wouldn’t be considered — although personally I think she would have been a fantastic choice. Ever the optimist, Ewing said he had no desire to portray himself in the film. He was, of course, certain that he would be free to accept the role if offered and not pacing the yard at San Quentin, or awaiting execution on death row instead of sitting in a canvas director’s chair with his name emblazoned on the back. The district attorney’s decision to prosecute Ewing for Evelyn’s murder when her body had not been found was an enormous risk. Ewing was the first person in California to face such a trial, making his case one for the books. Despite the lack of a physical body, Deputy District Attorney J. Miller Leavy, was confident that the corpus delicti of murder could be established. There was a mountain of compelling circumstantial evidence to bolster the State’s case. Leavy was not only certain of a conviction, he asked for the death penalty. One of the highlights of Ewing’s trial was a visit, by the jurors, to the Beverly Hills home he and Evelyn had occupied. Of particular interest to the jurors was the backyard incinerator where the remains of women’s clothing were found, and also the spot where Evelyn’s denture and eyeglasses had been discovered. One of the female jurors opened the door to the incinerator and peered in — although what she expected to find wasn’t clear. The defense attempted to cast doubt on the murder charge by claiming Evelyn had been spotted living on the East Coast, but they fell far short of refuting the prosecution’s robust case. 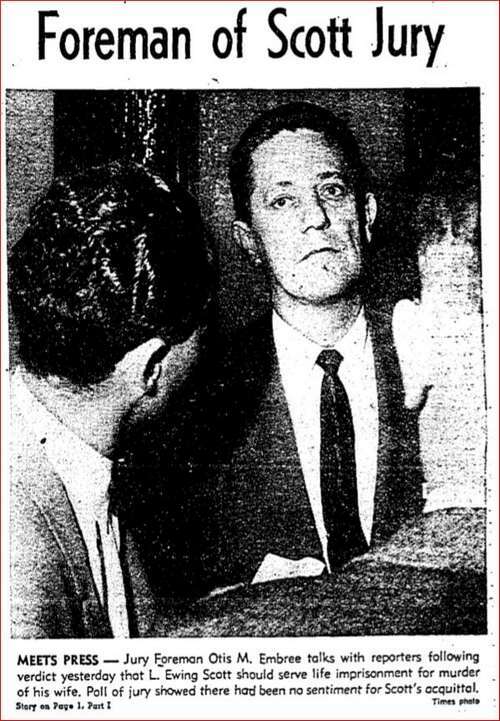 On December 21, 1957, the jury in the Ewing Scott murder trial returned a verdict of guilty of murder in the first degree for the slaying of Evelyn Scott. Ewing showed no emotion as the verdict was read. Several days later, following four hours of deliberation, the jury returned with their sentence: life in prison. The jurors who agreed to speak with reporters said that they had tried to find a way to acquit Ewing but “we just couldn’t.” The evidence of Ewing’s greed, manipulation, and the physical evidence of Evelyn’s glasses and denture, and the ashes of clothing, were too great to overcome. Nobody bought his contention that Evelyn was a drunk who left home of her own volition. Ewing appealed his conviction. The appeal was denied. He also had the balls to petition for $600 per month so that, according to him, he could pay to mount an investigation into Evelyn’s disappearance. In February 1963, Ewing was legally denied his request to share in Evelyn’s estate. In 1974, seventeen years after his conviction for Evelyn’s murder, Ewing was granted parole. He refused to leave prison. His reason for refusal was that he felt accepting parole would be tantamount to accepting guilt for Evelyn’s murder. Still vociferously denying his guilt, Ewing was released from prison in 1978. 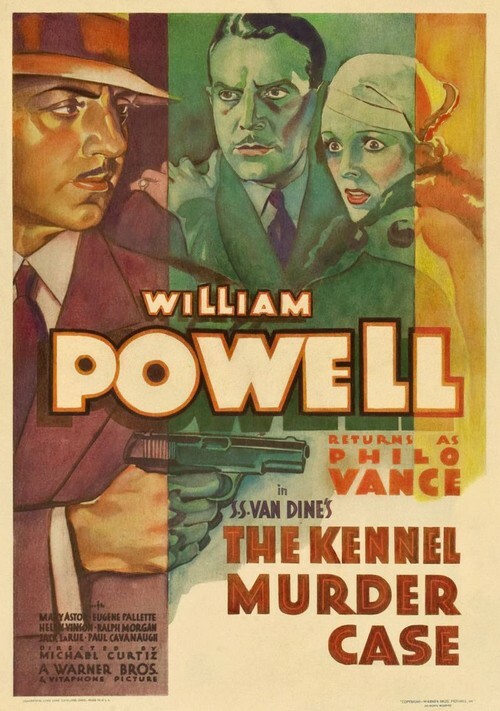 Tonight’s feature is one of my favorite crime dramas from the 1930s, THE KENNEL MURDER CASE, based on the S.S. Van Dine novel of the same name . The film was directed by Michael Curtiz and stars William Powell, and Mary Astor. Many film historians (including William K. Everson, who pronounced it a “masterpiece” in the August 1984 issue of Films in Review) consider it one of the greatest screen adaptations of a Golden Age mystery novel, and rank it with the 1946 film Green for Danger. When wealthy, heartless Archer Coe is found dead, ace detective Philo Vance joins forces with his nemesis, police sergeant Ernest Heath, to solve the case. 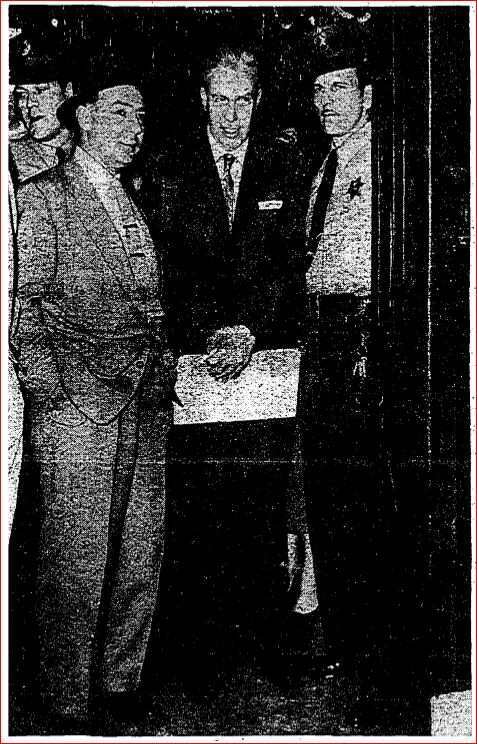 What first appears to be suicide turns out to be not only Coe’s murder, but also the killing of his brother Brisbane. There are several suspects, each with a strong motive: Hilda Lake, Coe’s ward, who deeply disliked her guardian and resented his control of her money; Sir Thomas MacDonald, who planned to marry Hilda, and whose outrage when his prize show dog was killed made him threaten Coe with revenge; Raymond Wrede, Coe’s secretary, who was also in love with Hilda and believed that Coe stood between him and happiness; and Doris Delafield, Coe’s mistress, who was about to run away with her art dealer boyfriend, Eduardo Grassi, when Coe caught them together, canceled a big business deal with Grassi and ended his relationship with Doris.